I'm not rushing anything, but when I need a cane, I want an Omhu cane. 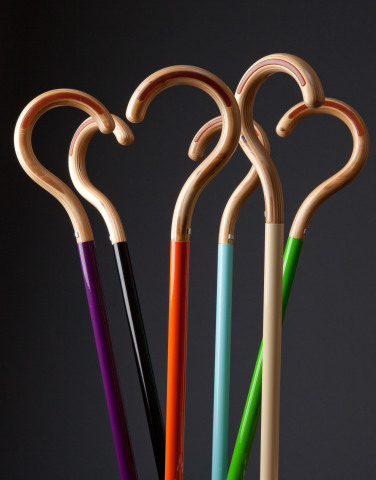 Not a plain ash, meld-into-the-background cane, but a bright, spirited, boomer cane that's right in your face. My father left his old wooden cane here last time he visited, and I practice walking with it every once in awhile - a perverse behavior, I'm told. It's neat to use. It feels like the walking sticks we hike with, even though it's shorter. But my Dad's cane lacks personality. And I don't know a single boomer that wants to be dull and plain. That's why the Omhu Cane is perfect for our generation... when we need it, of course. 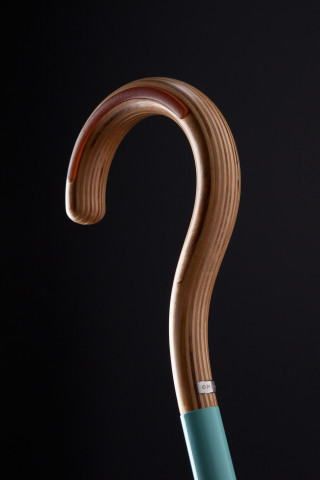 Not just pretty, the Omhu Cane is beautifully made, like a piece of fine furniture. The birch handle is hand-finished with Livos oil, an all natural plant-based oil. It has grips for your hands, which also keep the cane from sliding down the wall when you try to rest it there. Omhu Cane handle has two comfortable grips. 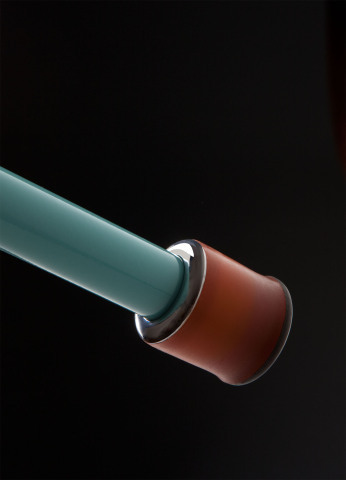 It has an aluminum shaft that makes for a strong but lightweight cane and the shaft is finished in American bicycle paint. And you don't have to worry about slipping with the patent pending cane tip. Imagine this: the tip is made like performance athletic shoes, providing cushioning, traction, and support... like a Timberland boot! Omhu Cane tip is designed with the features of a premier athletic shoe. Omhu is a Danish word for 'with great care,' and the Omhu company designs and makes items 'with great care' for persons with various impairments; all with a focus on the positive and the optimistic - just like we boomers are attuned. The Omhu cane is available in small (31"), medium (34") and large (37"). Custom sizes are also available through Omhu.com.